In his The Engineers and the Price System, originally published in 1921, Veblen observes that World War One demanded industrial innovations, and he was among the first to predict the need for changes in managerial struc-ture. Veblen saw that industrial output was more dependent upon techno-crats—managers and capital innova-tors—than financiers. 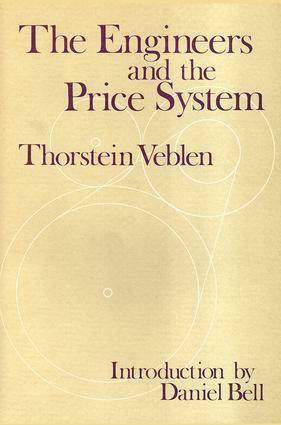 In The Engineers and the Price System, Veblen applies economic theory to modern industrial society. He demon-strates that revolutionary change can be advanced by managers and engi-neers upon whose "brains and skills" the state of industrial arts depends. In his uniquely comprehensive in-troduction, Daniel Bell discusses the associations and attitudes which mark Veblen as the prophetic outsider he remained most of his life.